The treatment for any dog toxic plants is to induce vomiting. If you have time, a local nursery is a good place to get a plant identification. Contact your veterinarian for instructions specific to your dog. 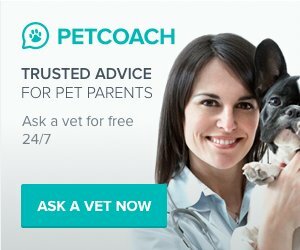 If you have any general questions, ask our Vet a non-emergency question here. Oak Tree: The oak tree has leaves and shoots that are toxic to dogs. Oleander: Every part of the oleander plant is poisonous to dogs, particularly the leaves. It contains the dog toxin referred to as glycosides. Symptoms are gastrointestinal, heart function problems, hypothermia and in some cases it can cause sudden death. Parlor ivy: Symptoms include mouth swelling, problems swallowing, breathing problems and stomach upset. Peace Lily (also called Mauna Loa Peace Lily): This plant has calcium oxalate crystals. If ingested by a dog it can cause mouth irritation, drooling, vomiting, swallowing problems and burning of the tongue and lips. Peach: Related symptoms to dog peach poisoning are vomiting, diarrhea and abdomen pain. Periwinkle: Acts as a hallucinogenic in dogs. Peyote: Same as periwinkle poisoning. 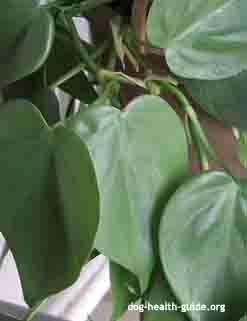 Philodendron Pertusum: This common house plant is poisonous to dogs. It causes burning and irritation on the tongue, lips and mouth. The dog will excessively drool, vomit and find it difficult to swallow. Pigweed: Varied toxicity in dogs. Poison hemlock: Varied toxicity in dogs. Poison Ivy: The leaves, fruit and bark of poison ivy are toxic for dogs. It can cause skin blistering and irritaiton if like in humans, the plant comes in contact with the skin. Poison Oak: In poison oad the bark, fruit and leaves are poisonous for dogs. Symptoms of dog poison oak contact are skin irritation. Poison Sumac: The poison sumac plant can result in severe dermatitis (irritation) or skin blistering if it comes in direct contact with dog skin. Privet: Symptoms of dog privet poisoning are diarrhea, vomiting and stomach pain. Pokeweed: The pokeweed is a dog poisonous plant found in fields that have toxic roots, berries and seeds. Symptoms include vomiting, stomach pain, heart issues, breathing problems, tremors and cramps. Pothos: dog poisoning symptoms include gastrointestinal upset, breathing issues, trouble swallowing, mouth swelling. Pot mum: There are several symptoms associated with pop mum's such as vomiting, painful stomach, tremors, heart problems, breathing issues and kidney problems. Are Poinsettia Plants Harmful to Dogs? 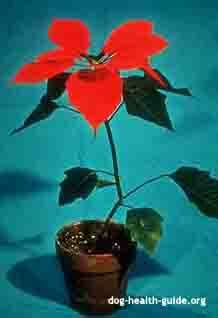 The poinsettia or Christmas plant has a relatively low toxicity rating when compared to other dog poisonous plants. That said, you should try and keep it away from your dog to avoid any symptoms, particularly the leaves, stem and flowers. Typical symptoms of this dog Christmas plant, if ingested, includes stomach irritation, skin irritation, plus mouth and eye irritation. Other signs include head-shaking, salivation or drooling, or trying to rub the mouth or eyes with the paws. The irritation is caused by the sap. To help, wash the sap off of the dog. If you see any symptoms that affect the dogs eyes, call your veterinarian, or if the symptoms do not go away in a few minutes. Poison hemlock: As the name implies, the leaves of the hemlock are poisonous for dogs. Potato: The shoots are sprouts of the potato plant are toxic for dogs. Pothos (Scindapsus, Epipremnum): this plant causes the tissues in the mouth to become swollen. It can also upset the dogs gastrointestinal system. Rain tree: Dogs suffering from rain tree poisoning are diarrhea, abdomen pain and vomiting. Rattle box: The entire wildflower is toxic for dogs. Red Princess: Symptoms of dog plant poisoning include stomach upset, respiratory issues, trouble swallowing, and mouth swelling. Rhododendron: A rhododendron is a common ornamental shrub with dog poisonous leaves. Rhubarb: The garden plant has canine poisonous leaves. Symptoms are varied. Ripple ivy: Possible symptom from this plant poisonous to dogs include heart problems, breathing issues, cramps, pain in the abdomen and vomiting. Rosary pea: The house plant rosary pea has dog poison seeds. Saddle Leaf Philodendron: Symptoms of irritation from saddle leaf include mouth swelling, trouble swallowing, breathing issues and stomach problems. 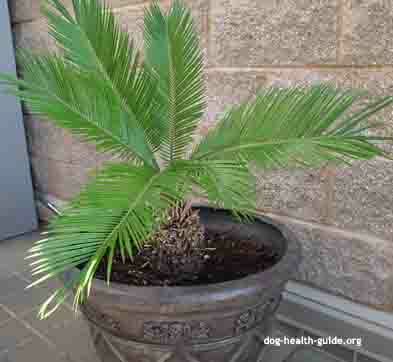 Sago Palm: Causes multiple symptoms in dogs including lethargy, jaundice, vomiting, diarrhea, depression, bruising, seizures, black tar like feces, increased thirst, and liver failure. Schefflera (Brassaia actinophylla): this also contains calcium oxalate crystals. This causes irritation in the mouth, and burning of the lips, tongue and mouth. Can also cause vomiting and drooling. Skunk cabbage: The marsh plant skunk cabbage is completely poisonous, particularly the leaves and roots. Symptoms include diarrhea and vomiting. Smartweeds: Do not let your dog lick the sap of the smartweed wildflower. Snow-on-the-mountain: This field plant has toxic sap when consumed by dogs. Soapberry: Dog poisoning symptoms are diarrhea and vomiting. Sorghum: A type of grass that has dog toxic leaves. Spinach: Symptoms in dogs are varied. Sprangeri fern: The fern can cause canine poisoning symptoms such as vomiting, stomach pain, cramps, heart issues, tremors, respiratory problems, and kidney issues. Spider mum: There are a range of symptoms including vomiting, painful abdomen, cramps, tremors, heart problems, breathing issues and kidney problems. Split Leaf: The split leaf or philodendron causes dog gastrointestinal symptoms, respiratory issues, trouble swallowing and a swollen mouth. Star of Bethlehem: A wildflower where the entire plant is toxic for dogs. Sunburned potato: symptoms vary by dog. Tomato Plant and Vine: symptoms vary by dog. Tuberous begonia: This plant can cause irritation in dogs such as mouth swelling, trouble swallowing, breathing issues and stomach or digestive upset. Tulip (Narcissus bulbs): The bulb itself is a dog poisonous plant. Symptoms include gastrointestinal problems, drooling, appetite loss, nervous system problems, depression, diarrhea, appetite loss and convulsions. Umbrella plant: Canine symptoms include heart problems, respiratory problems, kidney problems, tremors, cramps, vomiting and stomach pain. Velvet grass: The leaves of this grass are toxic. Water hemlock: symptoms vary by dog and can include convulsions. 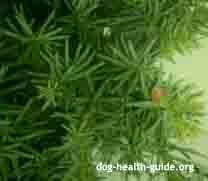 Western black locust yew: Related dog poisoning symptoms are diarrhea, abdomen pain and vomiting. Wild black cherry: This is a tree with toxic leaves. Symptoms are the same as the Western black locust yew above. Wild radish: The wild radish is a wild flower with toxic seeds for dogs. Wisteria: This is an ornamental plant with dog toxic pods and seeds. Symptoms in dogs are vomiting and diarrhea. Woody aster: A wildflower where the entire plant is toxic to dogs. Yellow Jessamine: An ornamental vine where the entire plant is toxic. 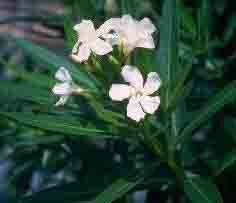 Yellow oleander: A garden plant that is completely toxic, particularly the leaves. Yellow pine flax: A wildflower with toxic seedpods, leaves and bark. The entire plant is considered to be dog poisonous. Yew (also called Japanese Yew): This is a highly toxic dog poison plant that can cause death in dogs. The toxin taxine is in Yew, which causes problems such as heart problems, weakness, trembling, a lack of coordination and respiratory problems.